Champagne flowed again for Bjorn Hansen and his eWork Sailing Team, after another nail biting day on the water resulted in the local heroes winning Stena Match Cup Sweden for a second year in a row. This takes Hansen’s victories to three at Scandinavia’s top match racing event, the third event on the 2013 Alpari World Match Racing Tour, ahead of Russell Coutts and Dean Barker’s two victories apiece, but behind Peter Gilmour’s seven wins. As we have seen in a few other crucial matches over the course of this week, all was not going well for Hansen early this afternoon as he found himself 2-0 down against New Zealander Phil Robertson’s WAKA Racing. But in the 10-12 knot winds and with brilliant sunshine that had encouraged the inhabitants of Marstrand, along with legions of corporate guests, to turn out in force, the defending champion seemed set on extending the racing as long as possible. On the long port tack up to the top mark Hansen managed to gain enough ground to luff Robertson and on the second occasion he tried this the umpires felt that Robertson failed to keep clear and awarded him a penalty. However in just one of numerous encounters on the race course today between the two equally aggressive finalists, a dial down on the second beat resulted in Robertson taking the lead only for him to lose it again just as they came into the top mark for the final time. Among the estimated 30,000 strong crowd lining Marstrand’s rocky shoreline, a massive cheer went up as Hansen regained the advantage and then proceeded to fend off Robertson down the run to take the deciding point and victory at Stena Match Cup Sweden. 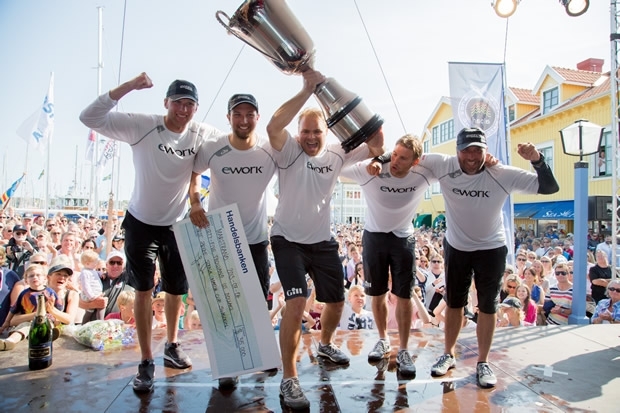 Arriving back in the dock there was huge emotion among Hansen and his crew of Gustav Tempelman, Phillip Kai Guhle, Sebastian Wedel and Mathias Bredin as champagne corks flew and the crews of both finalists ended up taking a welcome plunge into the Marstrand’s cool waters. Despite losing Robertson and his crew very much enjoyed today’s conditions, which with the wind a more moderate 10-12 knots, meant conditions were less survival with crews able to indulge in some more tactical racing. “It was good fun, great racing out there. The race course was perfect – the spectators were amazing. None of them were cheering for us – but that was alright! I haven’t seen a crowd that big before - it was incredible. I didn’t really appreciate it until the third race when the cheer went up as Bjorn crossed first! In the Petit-Final between Keith Swinton’s Black Swan Racing and Simone Ferrarese’s team it was the Italians who prevailed to take third place – well deserved, the Congressional Cup winner having led out of Qualifying. The Alpari World Match Racing Tour resumes across the Atlantic on 6th August, with the Chicago Match Cup.